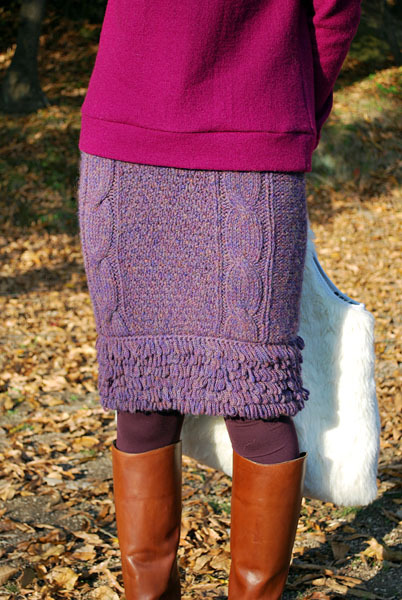 I knitted a purple skirt. The original version in the book is an ankle length-, hem fringed-, rather sporty- and tight brown skirt. As you can certainly see I shortened it quite a bit, but I knitted as exactly as the chart said except some minor executions and length. It has a knitted body with a crochet hem with fringes. I really like the color of the yarn. Isn't it nice! I've made two pairs of 3 tuck pants. I made two pairs (I said it twice) in the same fabric in different sizes, using a pattern. It may sound that I start mass production, but it's not the case! It was kinda an experiment. After finishing the one pair of these, I noticed that I could squeeze myself into a size smaller, and also that I couldn't resist to see how I look in different-sized same pants. I wouldn't think such thing if I was talking about jean pants, because I'd rather think I just look either of a woman in a tighter jeans or a woman in a larger sized jeans. But this time I imagined that different sizes of these kind of trousers on one person(me) might give very different styles and impressions. So I dared to check! 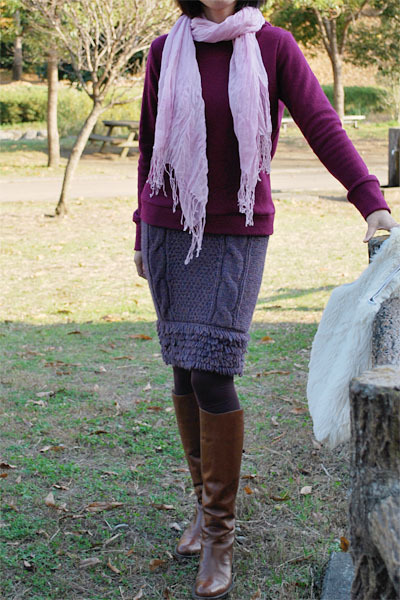 The pattern I used was for one of harem pants (called also sarrouel pants) from TAMANEGI-KOBO. The pants look quite similar to the ordinarily tucked pants, but actually they have a slight but obvious dropped crotch to give one tiny hint of those harem pants. I really like it. As you probably agree with me, the impressions of those pairs are different. The first pair (larger size) look more casual and gives more playful impression, and the second pair (smaller size, longer legs) looks more versatile and seems to fit for a matured wearer, staying on the side of fashion. It is not beyond expectations at all and it sounds so reasonable even without seeing the result, but I really love what I see here. I have learnt a lot about the idea of intended sizing for my future projects from these pairs. I also got two pairs of charming pants from one pattern in cheap. Lucky me!